"It puts real fuel in the tank in moving this forward." Social Development Minister Jean-Yves Duclos speaks to media in Victoria, B.C. on June 28, 2016. OTTAWA — Provinces and territories have agreed to fund a key financial pillar supporting the Trudeau Liberals' decade-long housing strategy, vowing to spend billions to repair and build social housing units and create a new rental benefit. Several of the key programs in the housing strategy unveiled in November rested on provinces and territories matching promised new federal funding to the tune of $8.6 billion. All regions, except Quebec, now have agreed to match about $7.7 billion in planned spending through to 2028. The fine print of the plan shows that up to half of what the federal government would count as matching funding can come from cities, Indigenous organizations, charities, or the private sector. The agreement also says that some money spent since the start of the month might also be counted against the $7.7 billion pledge. The Liberals have promised to introduce federal legislation that would make it difficult for a future federal government to back out of the strategy to help provinces and territories set long-term plans, instead of wondering how much they might receive year by year. "We know that this is extremely important for provinces and territories that want to plan over the long term,'' Social Development Minister Jean-Yves Duclos said in an interview Monday. The agreement signed Monday in Toronto lays out a framework that sets out how money is first going to flow to repairs and construction of affordable housing units, while ensuring no net loss in units, particularly for urban Aboriginals. What that means in raw numbers is adding about 50,000 units to the system and repairing 60,000 more, while promoting construction of mixed-income and mixed-use residential developments. Spending early on in the plan will focus on these bricks and mortar issues and shift to the $4 billion housing benefit that will become progressively portable, so about 300,000 households could have the supplement follow them if they ever decide to move out of a social housing unit. The new benefit wouldn't be rolled out until 2020, with the first dollars planned to flow in 2021, and the agreement suggests it be designed to avoid causing jumps in rent. Tim Richter, president of the Canadian Alliance to End Homelessness, said he was concerned the housing benefit wouldn't be truly portable, limiting its potential impact. "There is no evidence that portable housing benefits cause rent inflation,'' he said on Twitter. The speed with which Monday's announcement came together caught housing advocates off-guard. Pedro Barata, co-chair of the National Housing Collaborative, an umbrella group created to lobby the Liberals on the design of the housing strategy, said the agreement "puts real fuel in the tank in moving this forward.'' And Jeff Morrison, executive director of the Canadian Housing and Renewal Association, said the framework "removes a major stumbling block'' to implementing the housing strategy. Tim Ross, director of strategic affairs for the Co-operative Housing Federation of Canada, said the agreement gives certainty to low-income households worried about affording their homes. What the framework doesn't include is provincial and territorial blessing for a federal initiative to legislate a right to housing. 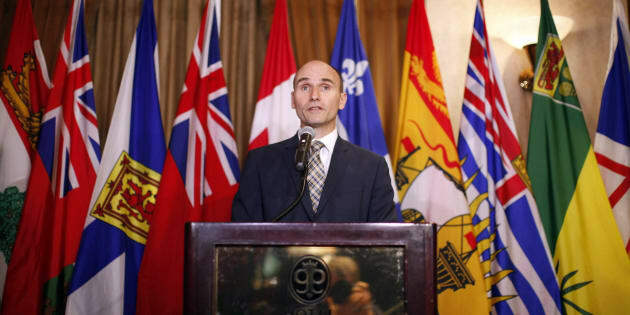 Duclos said regions had different views on how useful the promised federal rights legislation would be in reducing the country's housing crunch and the agreement references the idea only as a federal initiative. The next step will be to sign one-on-one funding agreements so federal money can flow to provinces and, ultimately, municipalities. And Duclos said that in a few weeks, the government will unveil the details of a new $15.9 billion financing program to help housing providers use their assets to leverage additional cash to build new apartments and homes.